The Wild didn’t move from its spot as the third seed in the Central Division during its four-day break, a position it solidified for that layoff with the point it secured Monday in an overtime loss to the Kings. But its cushion did shrink, with the Avalanche moving within two points – a gap the Wild can start to influence again when it resumes playing Saturday against the Predators at Xcel Energy Center. “We control our own destiny, and I think that’s all you can ask for our team right now,” coach Bruce Boudreau said. It is possible Colorado ties the Wild before the team takes to the ice; the Avalanche faces the Golden Knights at 2 p.m. Central Time. But since the Wild has played fewer games, it would still retain the third spot if the Avalanche tied it at 90 points. That push to the finish line begins against the Predators, who are skating as a Stanley Cup favorite. And Saturday isn’t the last time these two teams will square off; the Wild visits Nashville Tuesday to complete the five-game season series. 3: Straight wins for the Wild over the Predators at Xcel Energy Center. 12-6-2: Goalie Devan Dubnyk’s record in 21 games vs. Nashville. 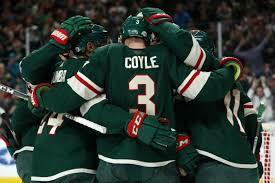 7: Game point streak for forward Charlie Coyle. 4: Shutouts for Predators goalie Pekka Rinne against the Predators. Jan.2: The Predators’ last regulation loss on the road. Nashville has already secured a postseason berth and is pacing the Western Conference with 106 points. The team recently had a franchise-record 15-game point streak snapped with its first regulation loss since Feb. 17. The Predators are still in the midst of a franchise-record point streak on the road (15) and win streak (nine). Rinne is 21-2-1 with a 2.02 goals-against average and .935 save percentage in his last 24 games. In front of Rinne, the Predators boast the eighth-best goals-per-game clip at 3.19.